Missing it will not be the best decision of your life. Shakespeare lives! Seldom if ever, has a Shakespearean tragedy been given such a magnificent treatment in cinema of any language. Sure, the narrative is fractured and fatally flawed at times, but like the hero's villainous uncle, who lies limbless writhing in pain in the Kashmiri snow pleading for death at the end, the narrative dares you to end the pain of a people who wear their brutal existence on their sleeves. Haider is a beast that just won't be tamed by regular cinematic definitions. There is flamboyance and subtlety, both at once in the treatment. Elegance and earthiness rub shoulders in the execution of what is regarded as one of Shakespeare's most complex tragedies. And to place Hamlet in militant Kashmir, what a masterstroke! Haider is the kind of rarest of rare cinema that unfurls wave after wave of exquisite narrative fuel into the frames, providing a kind of compelling narration that is propelled as much by the passionate writing as the intuitive direction. Mr Bhardwaj understands his Shakespeare inside out. He transmutes "Hamlet" into Haider with an unbridled fearlessness, tempered by a restraint of treatment that goes a long way in imparting an urgent sense of beauty to the work. The basic idea is compelling to the core. Freeing his narrative from the fretful freedom of excessive self-indulgence seen in his last film Matru Ki Bijlee Ka Mandola, Mr Bhardwaj's vision takes wings creating one of the most complex and compelling mother-son relationships seen before and after Yash Chopra's Deewaar. That Tabu and Shahid play the mother and son torn by the agonising disappearance of the man they both love (Narendra Jha, a surprisingly well cast actor in a role that is more about absence than presence) is a blessing for Mr Bhardwaj's Shakespeare. I don't think any other two actors could have better understood the political, cultural and emotional complexities of their characters. Tabu and Shahid get a firm grip on their characters and pitch their emotional compulsions into Kashmir's tormenting tale of terrorism during times of oedipal impulses. Their performing range hits the highest octaves without getting shrill. Tabu is the Lata Mangeshkar of the performing arts. The narrative - so supple and strong it defers any dispute regarding its raison d'?tre - opens on a fateful chilling night in Srinagar when a doctor accused of harbouring terrorists disappears. His wife shares a discernibly sexual relationship with her brother-in-law (Kay Kay Menon). And the son, who was forced to leave Kashmir by his militancy-paranoid mother, returns as an educated young man to see his mother's illicit relationship with his uncle (Kay Kay Menon). At times Mr Bhardwaj's vision turns playfully towards Shakespeare's plays. There is the comic relief in the form of two Salman Khan lookalikes running a video parlour in Mr Bhardwaj's Kashmir in 1995. Salman's films run playfully through the film like a prankish leitmotif, doing nothing to the main character?s pain-lashed lives. Towards the end three grave-diggers straight out of Shakespeare, sing and dance in and around the graves. Cinematographer Pankaj Kumar, who earlier shot the amazing Ship Of Theseus, penetrates and probes the brutal tragedy of Kashmir. Once there, the visuals insinuate a profound affinity between nature and man's cruelty. Who knows what goes on in the minds of politicians, poets and other nation builders? Haider looks at a grieving son's search for his missing father with languorous affection. There are bouts of tenderness and brutality in the narrative which sometimes overlap without warning. Above all, there are the performances - towering, luminous actors craning their collective creative necks into the director's vision, to give it mesmerising magical spin. While the supporting cast including Jha, Lalit Parimoo (remember him in Doordarshan's Kashmiri serial Gul Gulshan Gulfam? ), Aamir Bashir and a host of actors illuminate the edges of this darkly ignited revenge saga, it is the three principal actors who pin Bhardwaj's Shakespearean drama down to a level of cinematic lyricism. Kay Kay as Haider's treacherous uncle is so wickedly subtle evil yet humane that you wonder where this brilliant actor got waylaid in his journey in cinema. As for Shahid's torn troubled tormented Haider, the actor brings out all the inner conflicts in a shimmering rush of Shakespearean angst. With this one performance, Shahid proves himself notches above all his contemporaries. But it's Tabu whose haunted face as the bereaved wife and the troubled mother that will stay with me for many years to come. To the role of the mysterious dramatic deceptive woman, Tabu brings a kind of inner illumination that lights up the darkest corners of her character's soul. Her scenes with her screen-son Shahid are smothered in unspoken words and recrimination. Bhardwaj shoots one lengthy dialogue between the two in one single shot...and why not when you have two actors who seem to have visited the soul of the Shakespearean play and transported it to the pain of Kashmir? As Haider's love interest Shraddha Kapoor struggles to create space for herself in the mother-son saga. She has her brilliant moments towards the end where we see her humming a Kashmiri folk tune in numbed grief oblivious to the world that gave her that grief. Irrfan, who has a capricious cameo, also gets the film's only funny line. But this is not a film about laughter and humour. 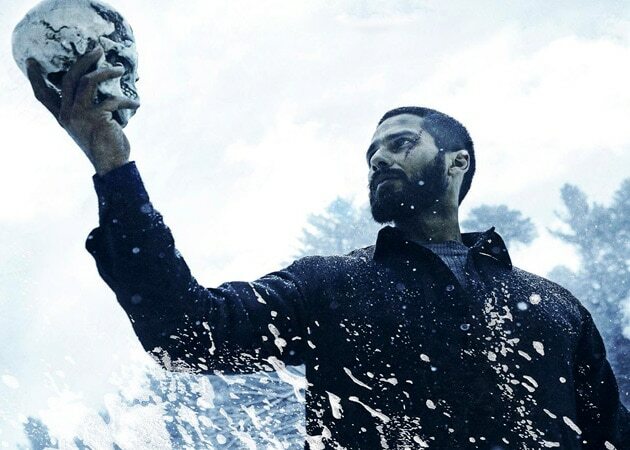 Haider looks at the grim reality of the Valley through a Shakespearean prism. Shahid's Haider is one of Hindi cinema's most tragic heroes ever. He bleeds into the narrative's heart without allowing a drop of blood to stain the surface. Mr Bhardwaj's third Shakespearean sojourn is his best yet. Haider is like a painting viewed from the road inside an art gallery. The vision is distant yet vivid, layered life-like and yet exquisitely poetic. By the time Rekha Bhardwaj comes on to sing an evocative song at the end about all the loss of the Kashmiris, I couldn't move from my seat. And yes, Mr Bhardwaj's background score rises and falls in swelling tides of blood soaked undulations. Besides Hamlet/Haider, the other truly tragic hero in this cinematic marvel is Kashmir. Set in a fatally flawed paradise Haider screams silently to be recognised as a wondrous work of art. To see or not to see? That isn't a question at all. Rush to the movies and forget all the slam-bang-bang stuff that is beckoning in glamorous postures. The glamour of Haider lies in fold after fold of poetic statement on love, life and politics. You simply can't help being seduced into attentive submission.